Karl achieved significant advances in synthetic biology during his PhD, developing a system to change the way proteins are synthesized in E. coli in order to produce authentic human-like proteins for fundamental biological studies and applications in medical research. 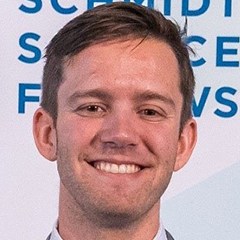 As a Schmidt Science Fellow, Karl has moved to Harvard to work in biomolecular engineering and technology development. Driven by a personal motivation following the loss of a close friend to a rare form of cancer, Karl hopes his work will underpin a shift in personalized medicine. Researchers hope that in the future doctors will be able to treat patients with targeted therapies, attuned to their individual manifestation of the disease and response to treatment, rather than broad and non-specific approaches. Karl’s work, with Dr Stephen Elledge, is developing personalized peptide arrays that will act as a valuable diagnostic tool to tell doctors how best to treat a patient’s disease. When used with standard DNA technology, including sequencing of a patient’s genome or tumor, this methodology could open new avenues for assessing disease, exploring new treatments, or reducing the side-effects of existing therapies. Karl strongly believes that it is important to see and to frame his science in ways that have the clearest relevance for patients and clinicians. Read Karl’s blog on the 2018 Oxford Global Meeting – ‘In the footsteps of giants’.